When you’re not sure what to do with your yard in the evenings, or you find that you can’t enjoy it at night because it’s too dark, it’s time for some outdoor lighting. That can help you get the most out of your outdoor space, whether you want to enjoy it on your own or with friends and family members. Whether you’re having a party or need a quiet place for reflection, the right landscape lighting for your Mansfield Texas yard can make all the difference. It provides safety and security and helps you and your guests see everything clearly, so you have less chance of tripping or getting hurt. There’s more to good landscape lighting than just security, though. 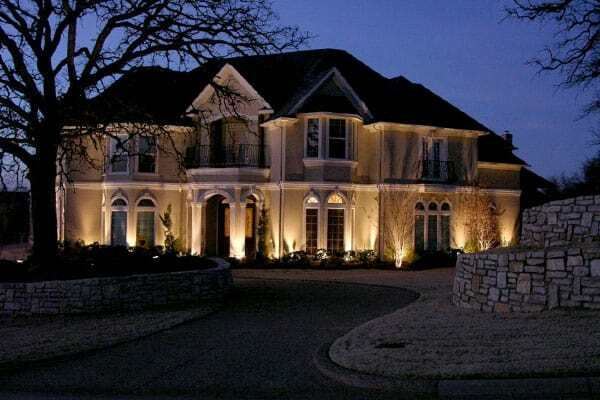 There is also a lot of beauty when you choose the right landscape lighting. The use of color, for example, can make an otherwise drab or plain yard really lovely. There are many options for different colors that can be used in low voltage landscape lighting, so you can accent specific plants and also showcase fountains, statues, or anything else you have in your yard. Adding lighting around patios and pergolas is popular, too, and you can even change the colors of our outdoor LED lighting to fit with the seasons, a party, or a particular theme, making your yard the envy of the neighborhood. When you’re ready for the best in outdoor lighting options, contact us. We’ll be ready to help you take your yard to new levels of beauty and elegance. Mansfield is a great place in Texas, and its proximity to Dallas makes it an even better choice for a wonderful area to live and work. 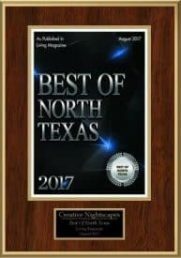 You get so much value for your money in Mansfield, TX, and there’s plenty to do nearly any time of the day or night. One of the best things to do in the area is to get out and explore nature. Elmer W. Oliver Park and other parks and green spaces in Mansfield are very popular places to play, exercise, or just relax and enjoy the day or the evening hours. You can bring your kids or spend some quiet moments alone, depending on what you like to do. There’s also the Hawaiian Falls Waterpark if you want a little more adventure in your outing. If you want to do something indoors, the Mansfield Historical Museum and Heritage Center is an excellent place to spend some time. You can learn all about the history of the area and the value that was created by the people who founded Mansfield and built it into what it is today. If you like to play golf or you want to jump on a trampoline, you’ve come to the right place. There’s always something interesting to get involved within the Mansfield area, and when it’s time to go home you can get back to the beauty and serenity of your lovely, landscape-lit yard. Five star customer service and installation. Highly recommend. Installed Kichler LED outdoor lighting at home in Fox Glen Village. Placed up lights to accent the front facade of home, columns, Maple tree, and Live Oak tree. Mounted a down lights and hardscape light under eaves to highlight the right side of the front porch and the driveway. Set path light to illuminate the walkway to front entry. Installing new kichler lighting system in Mansfield. Up lighting facade and trees. Adding driveway down light. Installed Kichler LED outdoor lighting at home in Hilltop Ranch. Set path lights to illuminate walkway and landscape greenery in back yard. Mounted down lights in eave to highlight pool deck walkway and waterfall. Placed wash lights and up lights to accent Palm trees and Crepe Myrtles. Installed Kichler LED outdoor lighting at home in Park Place. Placed up lights throughout property to accent the facade of home, canopies of Oak trees, Palm trees, Cedar trees, and Crepe Myrtles. Set well lights to highlight columns on front of home. Mounted hardscape lights in eaves to highlight garage doors and trellises. Performed quarterly maintenance for a residential client in Lakes of Creekwood; cleaned and tested all Kichler LED fixtures. Performed annual maintenance for residential client in Mansfield; tested and cleaned all Garden Light fixtures, and replaced one halogen bulb and all digital timer backup batteries.